I’m pleased to present the final installment of the “dinner party” series of recipes! You may recall that our evening with friends had us noshing on spicy Renegade Pickles, gleefully slurping Spicy Carrot and Cilantro Soup, and then devouring Fennel-Roasted Wild Alaskan Halibut — which brings us to the dénouement: Caramelized Figs with a Crème Fraiche and Orange Flower Water Sauce. What’s really wonderful about this dessert, though, is that you get a sweet treat that is high on the “wow” factor but still low on the calories. It feels much more decadent than it is — there’s not really that much crème fraiche or added sugar per serving — so it won’t make you feel awful (physically or emotionally) after you’ve enjoyed it. We’ve since made this dish again, and instead of using the cream, I insisted we try it with Fat-Free Greek Yogurt. Heating the yogurt in the skillet was a disaster — the yogurt curdled into a hideous, rubbery blob. Oops. Thankfully, the solution was simple: Don’t heat the yogurt; just mix it with a little orange flower water, then drop a dollop on top of the caramelized figs. Voilà! I didn’t snap any pics with the Greek Yogurt, so you’ll get a peek at the Crème Fraiche version. The recipe below accommodates both versions, though I definitely encourage you to go the healthier route and try it with the fat-free yogurt. Either way, it’s an outstanding dessert, sure to impress your dinner guests! 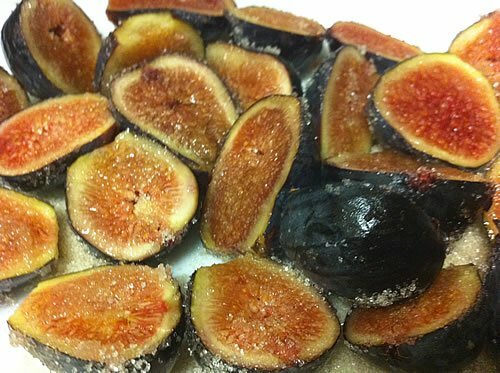 Spread the sugar on a plate, then roll each fig in the sugar until lightly coated. Heat a cast-iron or other heavy skillet on medium-high heat. Cook until the sugar begins to melt and caramelize, becoming an amber color. 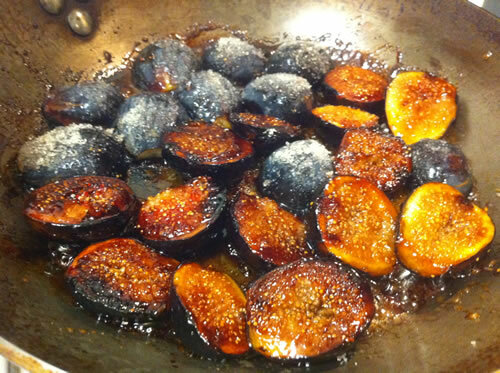 Turn the figs over and cook for another minute or so, then place on a serving dish to cool slightly. Turn off the heat. 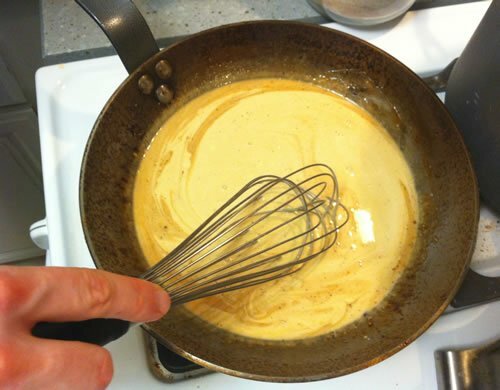 If using the Crème Fraiche: Immediately whisk it in the pan, stirring to dissolve the remaining caramel/sugar in the still-hot pan. This should take less than a minute. 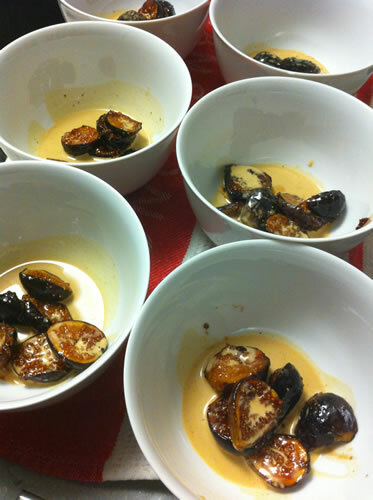 Add the orange flower water to the melted cream, and then pour over the figs. Serve immediately. If using the Greek Yogurt: Don't add it to the hot pan (that's where I went wrong the first time!). Instead, mix the yogurt and the orange flower in a small bowl, and simply place a dollop on top of the figs. (An alternate presentation: Place a spoonful of the yogurt on the bottom of the bowl or plate, and arrange the figs on top.) Serve immediately. this looks heavenly! I can’t find figs at the Farmer’s Market anymore, but Whole Foods still has them. It would make for a perfect, cozy dessert after a holiday meal. I like drizzling grilled figs with sweet balsamic and shaved dark chocolate. 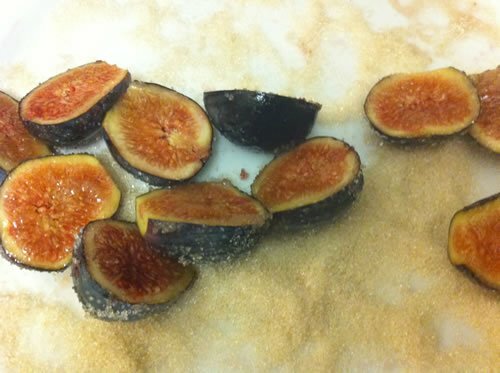 We made this a few months ago at the height of fig season… Looks like this one may have to be archived until next year. The balsamic and chocolate sounds wonderful!